The Amateur Radio Experimenters Group is proud to announce a new event on the Amateur Radio Calendar. The FreeDV HF Digital Voice QSO Party! The aim is to encourage as many Radio Amateurs as possible to learn about FreeDV and encourage as many FreeDV signals to be on the air as possible to help spread the word about this new mode. 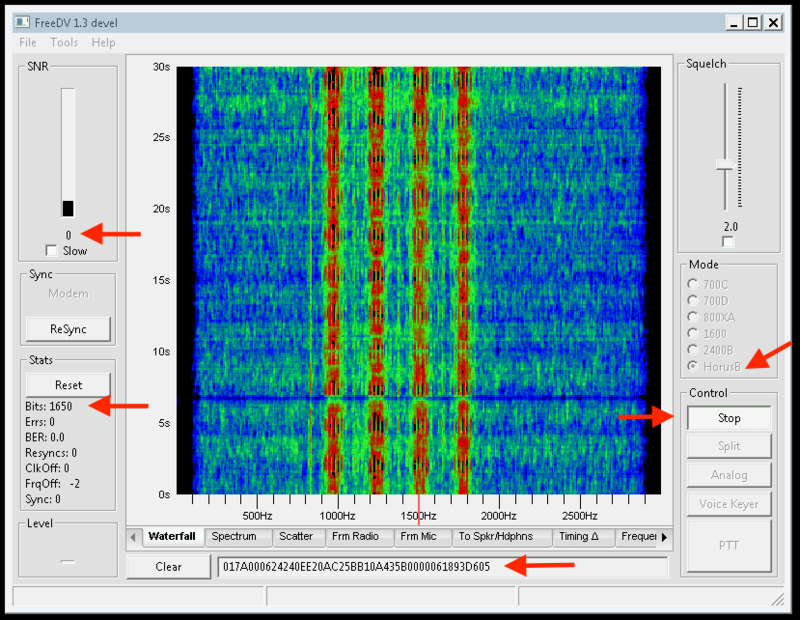 If you can use WSJT-X for FT8 or any other digital modes software then, with the addition of Headphones and a microphone on your PC, you can switch to digital voice transmission in an instant! Its that easy! So why not give it a try? This is a great way to experiment with something new from the comfort of your own armchair. All it takes is a little bit of time to download, install and setup the software – nothing more! What to know more? The QSO party rules are below, plus details of where to get FreeDV are included later in this bulletin. Read on! How: Work as many stations as possible using the FreeDV 700D or FreeDV 1600 modes in 24 hours. You can rework the same station once every 3 hours per band. You can work a station once per band. Stations earning 50 points or more will be entitled to an emailed PDF certificate indicating their successful participation in this inaugural event! There is one entry per station callsign only. The latest development, FreeDV 700D mode has performance equivalent or better than SSB on HF – a remarkable achievement in only 700 bps! FreeDV 700D outperforms SSB at low SNRs – you can get an easy copy of 700D when SSB is unusable. Amateur Radio is transitioning from analog to digital, much as it transitioned from AM to SSB in the 1950’s and 1960’s. How would you feel if one or two companies owned the patents for SSB, then forced you to use their technology, made it illegal to experiment with or even understand the technology, and insisted you stay locked to it for the next 100 years? That’s exactly what washappening with digital voice. But now, hams are in control of their technology again! FreeDV is unique as it uses 100% Open Source Software, including the speech codec. No secrets, nothing proprietary! FreeDV represents a path for 21st century Amateur Radio where Hams are free to experiment and innovate, rather than a future locked into a single manufacturers closed technology. FreeDV can be used on multiple platforms including Windows, Mac and Linux systems. Where can I get FreeDV? FreeDV software and more information is available from the FreeDV Website! If you live in Adelaide, South Australia, there are two events planned prior to the QSO party to help you get FreeDV operational. AREG will be holding a “Tech Night” on April 5th at the clubrooms in the Fulham Community Centre starting 7.00pm. In addition, David VK5DGR (FreeDV’s creator) will be our guest presenter at the April AREG meeting on Friday the 12th. Doors open at 7.15pm for that event. AREG is also looking to re-launch the FreeDV WIA News Broadcast. New times and frequencies will be announced soon! This provides a perfect opportunity to experiment with FreeDV reception while the broadcast is running for 30 minutes, plus you can participate in the callbacks afterwards. At the April meeting a new version of FreeDV is also going to be released that promises significantly improved audio fidelity over the communications grade 700D and 1600 modes. Why not put it in your diary and come along – visitors are most welcome! Login to the K7VE FreeDV QSO Finder to find other Hams using FreeDV. Developers please subscribe to the Codec 2 Mailing List. We hope to see you on FreeDV! For those who came in late…………. 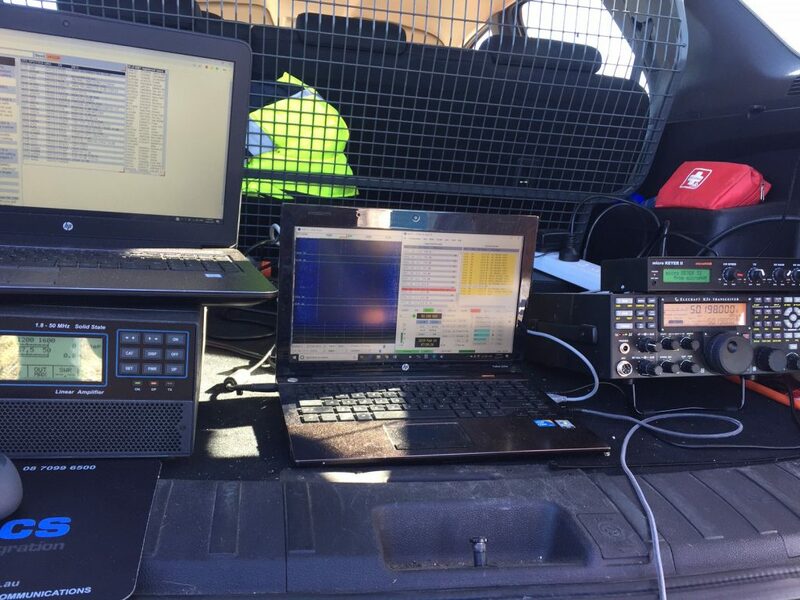 The VK5RWN D-Star gateway and repeater system was upgraded in May June 2018 with a new computer running 64 bit CentOS 7 and the new Icom G3 gateway software. Between then and March 2019, the system has proven to be relatively stable with only a couple of minor hiccups where the computer has shut itself down? We believe this may have been due to the CPU over heating or something similar? This is still being addressed. VK5RWN is a D-Star gateway system, registered on the US Root Trust database and primarily runs an application called Dplus which manages the linking and routing functions on the D-Star Internet network between other D-Star gateways/repeaters/reflectors. As such, users are able to connect to other repeater/gateways and Dplus based Reflectors anywhere around the World, or even to other registered D-Star users via Call Sign Routing, a bit like a “private” call in the commercial PMR world. In principle, within the D-Star world, there are two D-Star Internet networks, the Dplus/US Root Trust network and the ircDDB D-Star open network. Again in principle, the two are mutually exclusive networks and are not interconnected. Hams being hams, they just cannot help themselves, the challenge was there and so software was developed that when installed on the Dplus Icom based gateways, allowed interconnectivity into the ircDDB networks and allow access to the XRFxxxX and DCSxxxX based reflectors. One version of this software is called “g2_link” and is designed to be added to existing Icom based D-Star gateway systems on the US Root Trust network. 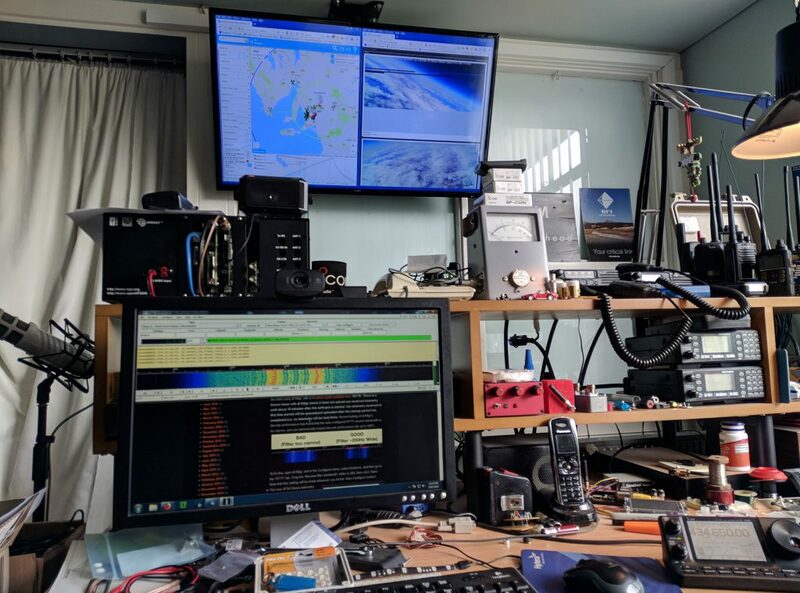 Early March 2019, Michael VK5ZEA, who is custodian of the VK5REX D-Star system on lower Eyre Peninsular, advised me that he has rebuilt the VK5REX system and had successfully installed the “g2_link” software with the help of Terry, KA8SCP. Michael also passed on Terry’s contact details, whereupon I made contact and asked Terry if he would mind assisting with installing the “g2_link” software on VK5RWN. Terry most kindly agreed to assist and arrangements were made that allowed Terry to install the software and set up the necessary configuration and interlocks so that both the Dplus and the ‘g2_link’ accessed networks could be worked via VK5RWN. This now allows for D-Star users to access VK5RWN via a RF input from their D-Star radios and they may now access both the REFxxxX, XRFxxxX and DCSxxxX reflectors and gateways. 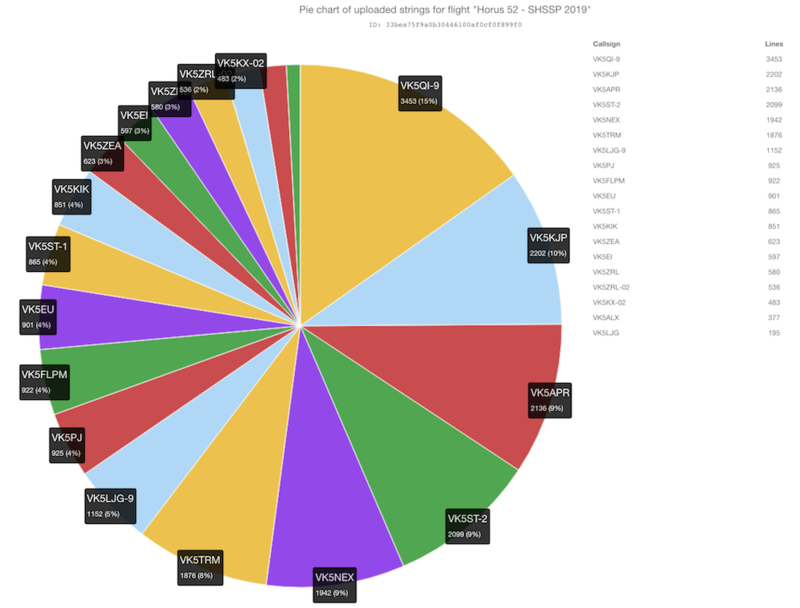 A bonus as part of this new configuration, new Dashboards were part of the set-up and now show the connection status and ‘Last Heard’ lists of the VK5RWN system. For D-star users, please read the instructions at the bottom of the XRF/DCS Dashboard. This is important as there are two distinctly different “linking” or “unlinking” commands to connect or disconnect to and from REF reflectors and the XRF/DCS reflectors. This is so that the system can differentiate between a request via Dplus or the ‘g2_link’ and allow the respective link request to be actioned or disconnected. 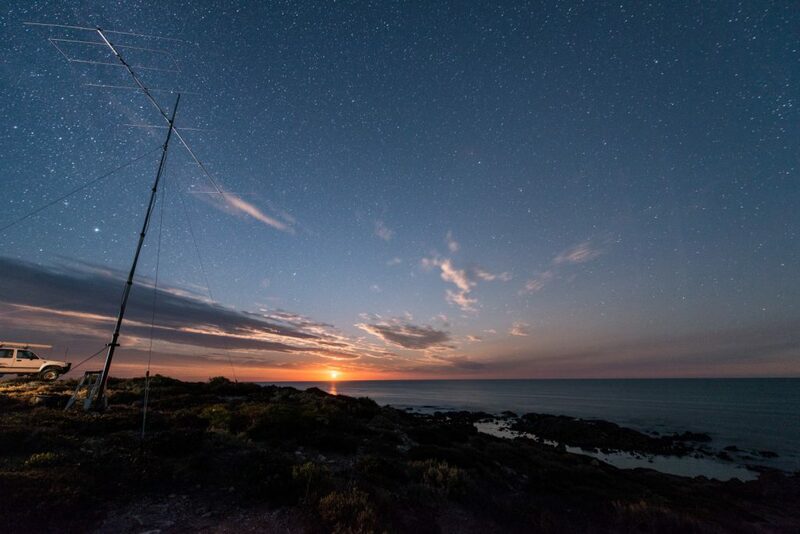 It is recommended for D-Star users to use VK5RWN Port C, the two metre port, for connecting to any of the reflectors as VK5RWN Port B, the 70cm port, is normally permanently connected to the REF023C Australasian/Oceania reflector. Before connecting to a reflector, please ensure that the Port is not currently connected to anywhere else. The VK5RWN B 70cm port may be used, but it must be disconnected from REF023C first. I wish to thank Michael VK5ZEA for his support and advice and especially Terry, KA8SCP, for his help, patience and advice where I needed to do some house keeping that allows VK5RWN to function as a flexible D-Star gateway, allowing D-Star users access to the big wide world via both the Dplus and ircDDB D-Star networks. This year AREG was once again involved with the International Space University’s Southern Hemisphere Space Studies Program (SHSSP), hosted by the University of South Australia. As with previous years, AREG performed a high-altitude balloon launch, carrying a SHSSP-developed payload. AREG members also worked with the project participants, running tutorials on various aspects of the launch. The planned launch date was the 2nd of February, but had to be delayed a week due to poor flight-path predictions. In the lead-up to the new launch date (9th of February) predictions were looking good, however as the date got closer the prediction moved further and further north with a predicted landing to the west of Morgan. To make things even more interesting, the chance of showers at the launch site increased from 10%, to 30%, then to 70% over the final 3 days before the launch, along with predictions of 30kph winds. Still, launch planning continued, and on the morning of Saturday the 9th of February the Project Horus launch crew and the SHSSP participants assembled at the Mt Barker High School oval for one of our most challenging launches to date! 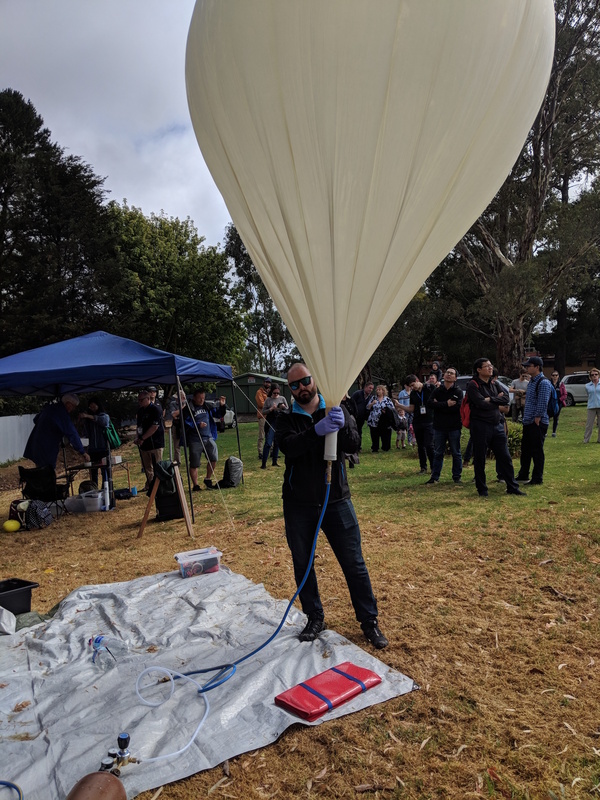 After finding a filling location mostly out of the wind, the launch crew were able to get the balloon filled quickly and get the payloads laid out ready for launch. SHSSP participants assembled and tested their payload, before sealing it up ready for the launch. Just as the planned launch time of 11AM approached, the launch director was informed by Air Traffic Control that a 10 minute launch hold was required. This couldn’t have come at a worse time, as the wind started to immediately pick up. The balloon wranglers had a very challenging time stopping the balloon from blowing around in the wind, with the latex envelope coming dangerously close to bursting many times. Finally the launch was given the all-clear from ATC, and the payloads were released during in a short lull in the wind, using the classic ‘running launch’ method. Unlike a previous launch in high winds, the payloads easily cleared the trees and were on their way to the stratosphere. A big thanks to all the launch crew for helping out – it was great to see many members at the launch site, and it certainly made this challenging launch a lot easier! The chase teams for this flight consisted of Mark’s team (Mark VK5QI, Andy VK5AKH and Will VK5AHV), and Liam VK5LJG flying solo. As the flight path was predicted to be a long one (landing near Morgan! ), the teams set of immediately after launch, leaving pack-up to the rest of the ground crew (thanks guys!). 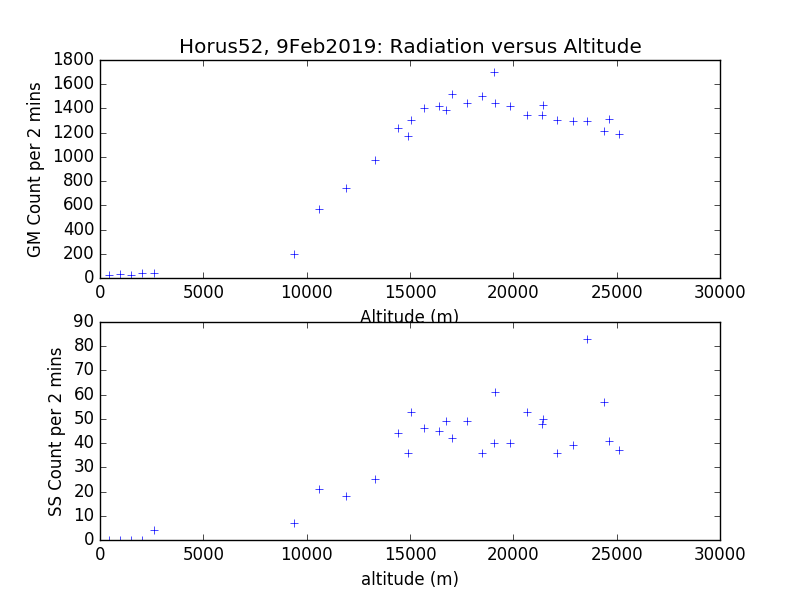 While the AREG ground station deployed and manned by Peter VK5KX collected as much of the telemetry as possible from the multiple transmitters on this flight. As for the chase and recovery teams, they steadily drove north through Palmer and Sedan heading for an expected landing near Morgan. 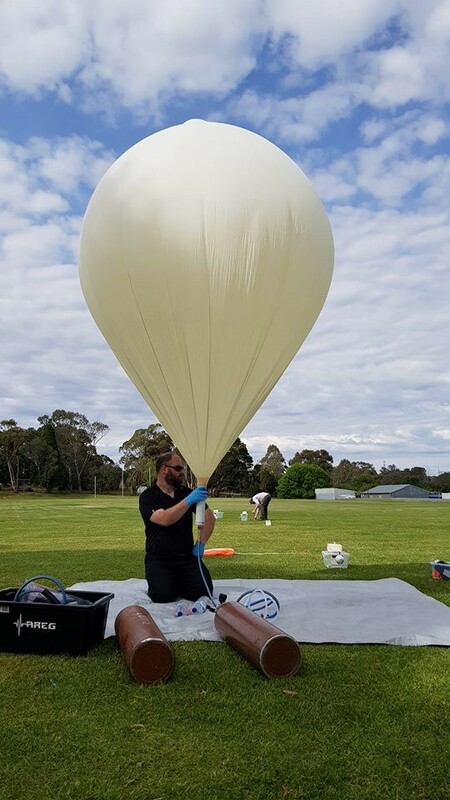 The teams were caught by surprise by the balloon’s early burst at 25km altitude (the expected burst was 35km), which shifted the resulting landing prediction very close to the River Murray north-west of Waikerie. Mark’s team immediately diverted through Blanchetown and headed towards landing area, and were able to track the payloads down to 62m altitude from the highway. A route to the landing site (in a vineyard at Qualco) was determined, and the team continued on. Unfortunately Liam VK5LJG had a vehicle fault, and had to stop at the Blanchetown roadhouse to await repairs. 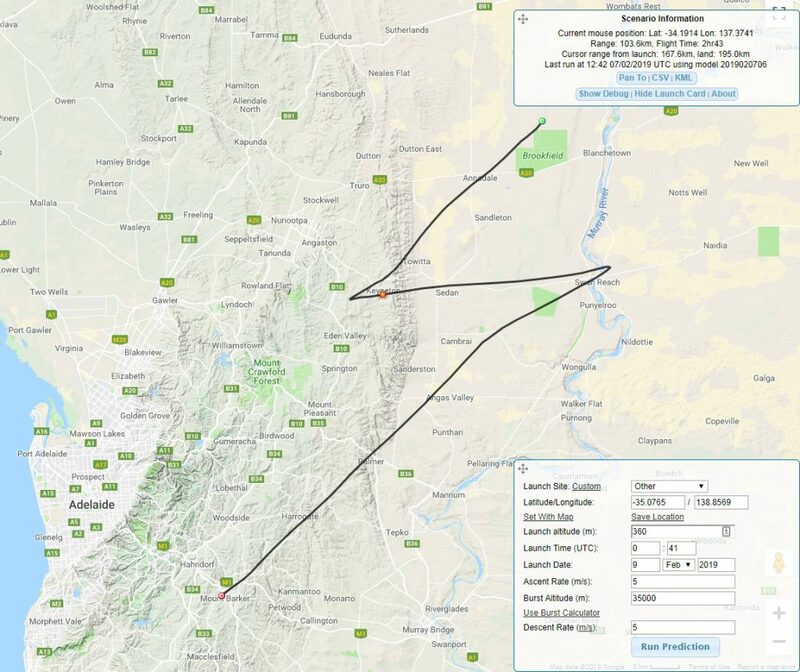 While Mark’s team was approaching Waikerie, Steve VK5ST also made an appearance – he had been waiting near Morgan for the balloon to land, and had made his way to the landing area. After a brief discussion with the Vineyard manager the teams were able to drive right to the payloads, which had landed across four rows of ripe grapevines. 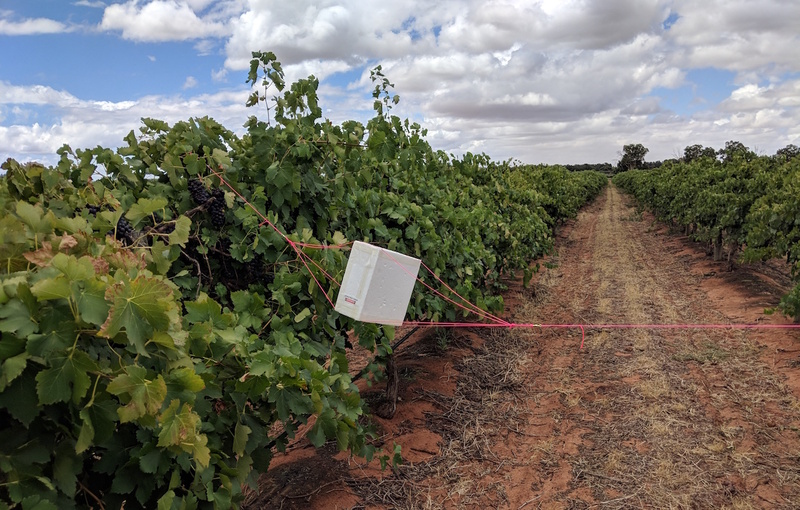 The SHSSP payload, suspended between grapevines. Mark’s team then headed on to Waikerie for a much needed Bakery visit! As usual, we had a good showing of Amateur Radio operators from around the state receiving telemetry from the balloon. It was good to see a few new callsigns tracking telemetry (Hi Liam!) as well as our regulars. This flight featured two Wenet imagery payloads – one with a downward-facing camera, and one outward-facing (for nice horizon photos). For the most part, these were identical to the Wenet payloads flown in previous Horus launches. The downward-facing payload was also configured to to receive telemetry from a SHSSP-designed payload and relay it to the ground via the Wenet FSK downlink. Even though it was quite cloudy, the two payloads were able to capture excellent imagery throughout the flight. 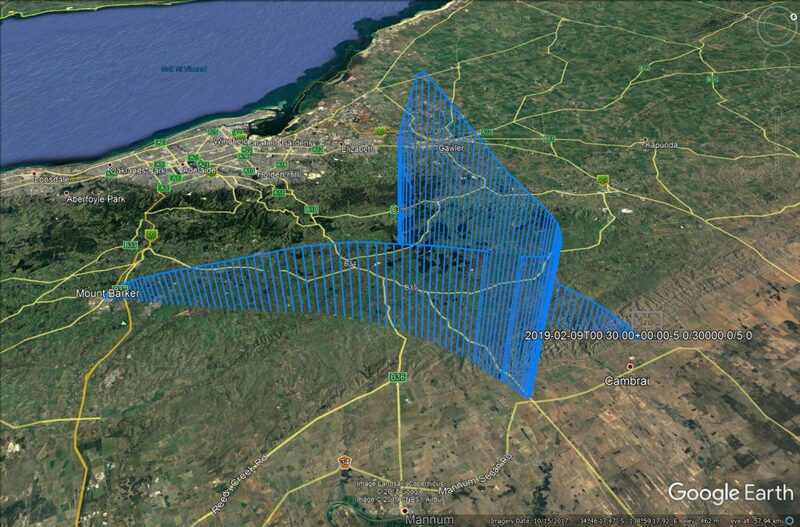 This year, the SHSSP decided to develop a payload to measure ionising radiation throughout the balloon flight. The majority of ionising radiation observed in the troposphere and stratosphere are a result of cosmic rays interacting with particles of air, producing showers of secondary particles which can be observed using radiation sensors. Two radiation sensor types were used: a geiger-muller tube, and a PIN-diode-based sensor. 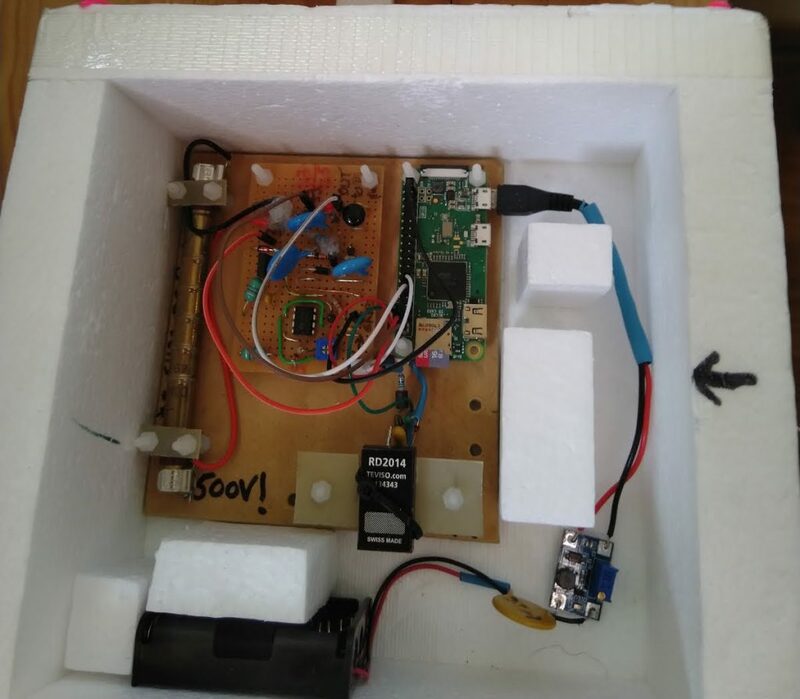 Radiation detection events were logged by a Raspberry Pi Zero W, and relayed to the downward-facing Wenet payload for transmission to the ground throughout the flight. These plots show the ‘Regener-Pfotzer Maximum’ at ~18km altitude the characteristic peak in the distribution of charged particles in the atmosphere. Above this point the radiation intensity drops due to there being less atmosphere for cosmic ray interactions to occur; below it, the intensity drops due to secondary particles being blocked by denser atmosphere. A full writeup of the payload and results are over on Bill Cowley’s blog. With the usual excellent imagery from the Wenet payloads, and the good data from the SHSSP payload, this flight can definitely be considered a success – even with the early burst. Thanks again to all who participated, and we look forward to more Project Horus flights in the future! AREG is pleased to report that its VK5RSB 70cm service is now back to full working order after suffering from an intermittent receive fault for many months now. The problem was tracked down to a faulty antenna allowing water ingress into the feed line. A new dipole array antenna has now been installed and the feed line has been re-terminated. Early feedback suggests the repeater’s coverage has been restored to normal. Further reports would be most welcome! The LDF5-50 coax termination connector at the top of the coax was removed and internals examined. Plenty of corrosion was found – all green! Meanwhile, down in the hut, Paul VK5BX could not help himself. He pulled the rack installation apart and refitted all of the equipment and created additional rack space, helped by Peter VK5APR. Once the VK5RSB repeater was all connected back up, the system was tested. The team measured 75 watts up the “stick”, with 1 watt returned, an excellent outcome! Horus 52 – Saturday 9th February 11.00am Liftoff! AREG is pleased to once again be involved with the International Space University’s Southern Hemisphere Space Studies Program hosted by the University of South Australia. This year one balloon is being launched from Mt Barker High School as part of the program. All amateurs across the state are invited to participate in the flight through collecting the RTTY telemetry. All you need is an SSB receiver on 70cm, and an interface to your computer. The rest is software! Our usual 100 baud 7N2 RTTY telemetry on 434.650 MHz USB. This can be decoded using dl-fldigi, with a reception guide available here. NOTE: There is a known issue with dl-fldigi where it does not upload any received telemetry until about 10 minutes after the software is started. Any telemetry received in this time period will be queued and uploaded after the startup period has completed (i.e. no telemetry will be lost).Note: Recent testing of dl-fldigi’s decode performance has found that the auto-configured RTTY receive bandwidth is too narrow, and can detrimentally impact decode performance (by up to 3dB!). To fix this, open dl-fldigi, and in the Configure menu, select Modems, and then go to the ‘RTTY’ tab. Drag the ‘Receive filter bandwidth’ slider to 200, then click ‘Save’. Note that this setting will be reset whenever you hit the ‘Auto-Configure’ button! The new 4FSK Binary telemetry will be transmitting on 434.640 MHz USB. This uses a separate decoder, with setup instructions for this available here. We would love reports of how the 4FSK signal compares to standard RTTY! Reception of the Wenet signal requires a RTLSDR and a Linux PC/Laptop. Instructions on how to set up the required software are available here. Note that users running an ‘older’ version (Circa mid-2018) of the Wenet receiver software will need to apply a -220kHz offset to the above frequencies in their setup_rx.sh file (i.e. 440980000 or 443280000) – or just leave them at their defaults, which should already be correct.. Those running the latest version can just define the centre frequency as-is. Older versions of the Wenet software will show a lot of ‘Unknown Packet Type’ messages due to some new telemetry formats we are trialling on this flight. Follow the #SHSSP hashtag on Twitter for updates from the launch and chase teams on the launch day. The following will give you an idea of the expected flight track for Saturday. It is going to be a LONG chase this time! See you all on Saturday! AREG is once again involved with the University of South Australia’s Southern Hemisphere Space Studies Program this year, which is run by UniSA on behalf of the International Space University. The launch, which was scrubbed last week due to the predicted landing zone is now planned for this coming Saturday 9th Feburary, with liftoff planned for ~11AM. The weather is looking much better! There is still a chance the second Wenet payload will be dropped from the launch due to weight restrictions, so if you don’t see any signal on 443.5 MHz, that’s what’s happened! As always, amateurs from across the state are encouraged to take part, by collecting the telemetry data and relaying it to HabHub on the Internet. This data is used to help fill in any missing data the chase teams fail to capture, which they can use to help maximize their landing zone prediction accuracy. In that way, everyone taking part is adding to the success of the mission. Tracking details will be provided closer to the launch. Keep watching the AREG website for details!